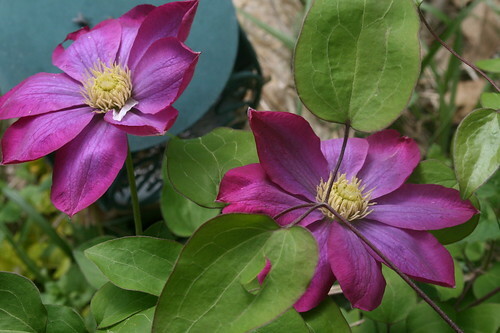 Magenta clematis, originally uploaded by DianthusMoon. It’s a great year for Clematis! I have two of my three vines in full bloom. Heading out to take more photos to clear my head soon. I have a few big projects under way-craft stuff sorting and changing winter to summer clothes. We don’t have enough closets in this house! And I do have too many clothes. I take pretty good care of them and they don’t wear out. I had so much stuff jammed in the corner of my dining room (my craft ‘room’, but Sean’s room will be that area someday) that I opened a tin that I thought contained pens, etc. and inside were Cmas cookies! They were 4.5 months old, but looked perfect. I was mad at the stupidity of forgetting about food I spent an hour or more making -grrr! So there is more drama going on in my extended family-one reason I can’t seem to think straight a lot of the time. I’m going down in a few days to see what I can do, if anything. It seems nothing ever changes as some people are never happy or are very stubborn. And they need help from the entire clan. Wish me luck! The clematis is so beautiful. I bet it was quite a surprise to find the cookies–LOL. Good luck with the family meeting.